Stansted Airport is expanding. There's a demand for skilled workers in flight operations, cabin crew, airside and landside operations, security, aircraft dispatch and air traffic control. We can provide you with the skills and knowledge you need for a career in the aviation industry. Qualified and highly skilled engineers are increasingly in demand. Our Engineering courses will focus on two key areas – Aeronautical Engineering and Operations Maintenance Engineering. If you're passionate about delivering a quality service and are hard working and dedicated, then a career in hospitality or events management could be an exciting and rewarding option. Choose a date and book your place on Eventbrite. Stay in touch to get updates. Want to know more about a course? Aside from finding the right course to suit you, there are many things to think about when you are choosing a college or sixth form including the quality, how good the facilities are, what support is on offer, what student life is like and what opportunities you will have after you have finished your course. 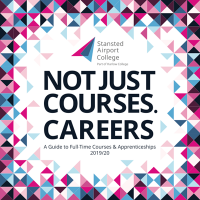 Stansted Airport College is the first of its kind in the country and as such offers you a unique opportunity to get onto the first rung of the career ladder within the aviation industry. We have strong partnerships with a whole range of employers on the Airport campus – check out this website to see who we are working with. Our partners are involved in the design and delivery of the curriculum, providing work placements and offering real job opportunities at the end of your course. We have a purpose-built facility and state-of-the-art resources, so that our students are used to working in a professional environment. Being part of Harlow College, we are recognised by Ofsted for our Good quality, support for students and we have excellent systems in place to make your learning exciting, meaningful and innovative. Be part of this truly exciting project and help train the next generation of aviation industry professionals. If you're female and have a passion for Engineering, are endlessly creative and a great problem solver, then this event is for you! Stansted Airport College is holding a Girls Into Engineering event – a great opportunity for budding female engineers to get a taste of what it’s like in the industry; meet industry professionals and take part in workshop activities. Witness the sights and sounds of a specialist campus located in the hustle and bustle of a busy Airport whilst meeting our tutors and trainees, finding out more information about our courses and exploring our first-class facilities. Get on board and ready to launch your career. If you don't make the grades come and speak to us as we will have people on hand to offer you advice and guidance and we may even be able to find you another suitable programme. Stansted Airport College is committed to keeping your personal data safe and will act within the latest legislation regarding data protection (General Data Protection Regulation). The data that you have provided in this form is used to process and assess your enquiry to Stansted Airport College or for any other legitimate reasons such as compliance with relevant legislation. All data will be stored securely and retained in line with the College's Data Protection Policy. We do not share this data with any external organisation unless we have a fair and legitimate reason to do so. You will remain on this mailing list until three months after the end of the academic year, after which you will be contacted to join the following year’s list. Should you wish to unsubscribe, details on how to do so will be found in all communications you receive.